This analysis compares the compensation of Apple’s top executives to the compensation received by the Chinese workers of Apple’s supplier Foxconn. The most complete data are for 2011. 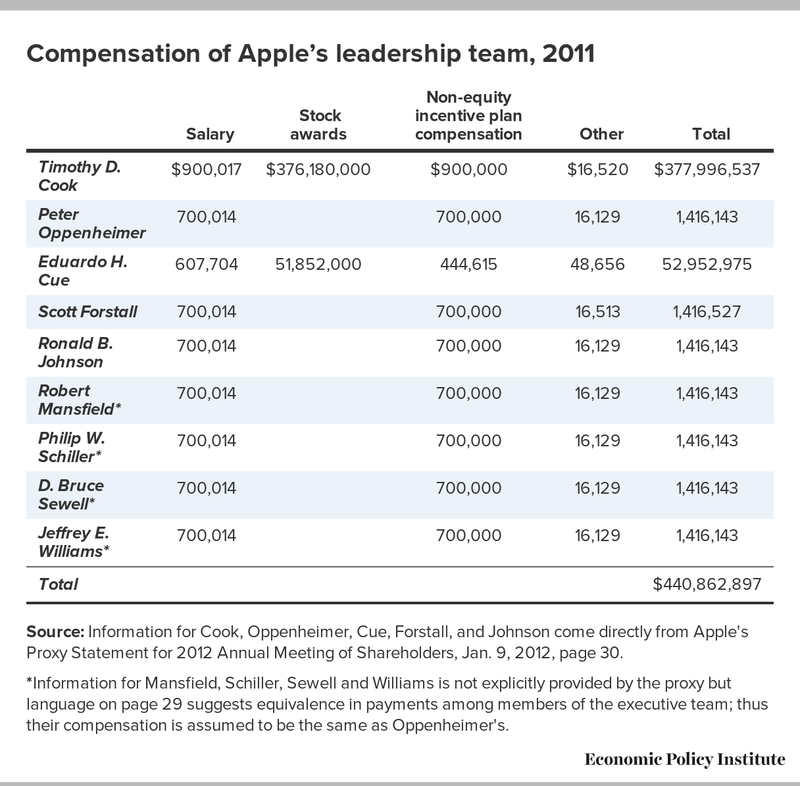 In that year, Apple’s nine-person executive leadership team received total compensation of $441 million. This was equivalent to the estimated compensation of 95,000 Foxconn factory workers assembling Apple products. Enough information is now available to make a reasoned comparison for 2012, and the findings are similar. The executive team is on track to receive compensation of at least $412 million. This conservative estimate is equivalent to the compensation of 89,000 of the Chinese factory workers making Apple products. These calculations are explained in full below. The difficult working conditions experienced by Chinese workers employed at Foxconn who assemble Apple products have received widespread attention this year. In March 2012, at Apple’s behest, the Fair Labor Association completed an investigation of these conditions, which included a survey of the Foxconn workers. Among the findings were that “64.3 percent of workers thought that their salary was not sufficient to cover their basic needs” even though they worked under difficult circumstances and for an average of 56 hours per week. The FLA survey found that over the previous three months, the average monthly salary for non-supervisory workers was 2422 RMB. This is equivalent to $385 per month or $4,622 per year. This includes wages from the substantial number of overtime hours these workers put in (frequently in violation of China’s legal maximum and Apple’s own labor policies). This analysis’ calculation of the annual number assumes that salaries over the three months covered by the survey reflect those received throughout the year. This approach may overstate wages for 2011 (since wages may have risen since then) and may understate wages for 2012 (since wages may rise further). Table 1 below provides a detailed description of the total of $441 million received in compensation by the nine executives making up Apple’s leadership team in 2011. The team, as defined by Apple, consists of its chief executive officer and eight senior vice presidents. Source: Information for Cook, Oppenheimer, Cue, Forstall, and Johnson come directly from Apple's Proxy Statement for 2012 Annual Meeting of Shareholders, Jan. 9, 2012, page 30. *Information for Mansfield, Schiller, Sewell and Williams is not explicitly provided by the proxy but language on page 29 suggests equivalence in payments among members of the executive team; thus their compensation is assumed to be the same as Oppenheimer's. The table is largely drawn directly from page 30 of Apple’s definitive proxy statement submitted to the SEC on Jan. 7, 2012 for use at Apple’s annual meeting (estimates of some relatively minor compensation were added to this table to make it complete). The vast majority of this compensation came in the form of stock awards issued to Apple’s new CEO Timothy Cook ($376 million) and to Eduardo Cue ($52 million) upon his elevation to senior vice president. The somewhat complicated nature of Apple’s stock awards is described in a separate section below. Sources: Apple Inc., Proxy Statement for 2012 Annual Meeting of Shareholders, Jan. 9, 2012, pages 16, 29-30. 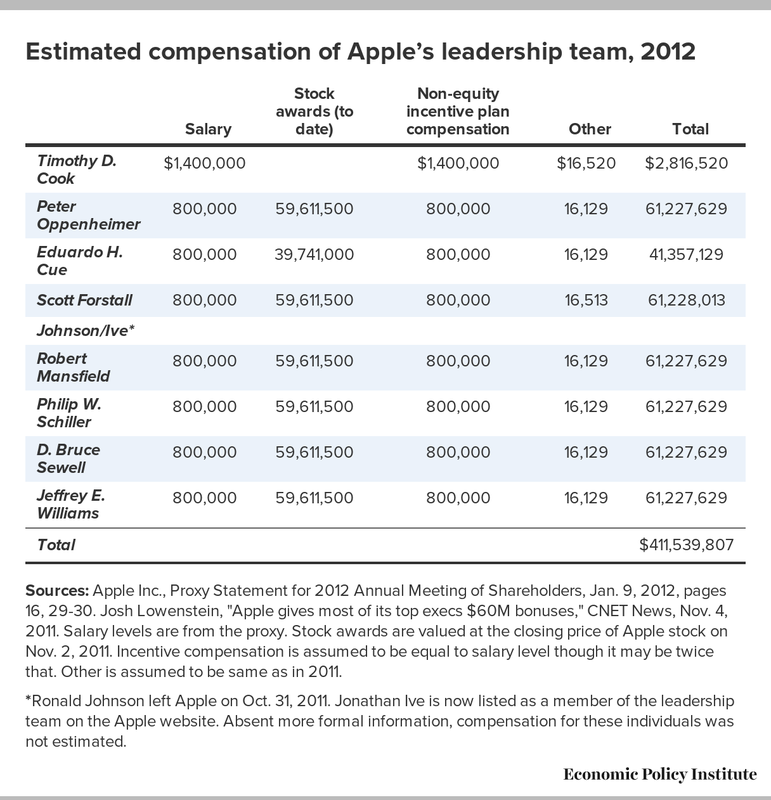 Josh Lowenstein, "Apple gives most of its top execs $60M bonuses," CNET News, Nov. 4, 2011. Salary levels are from the proxy. Stock awards are valued at the closing price of Apple stock on Nov. 2, 2011. Incentive compensation is assumed to be equal to salary level though it may be twice that. Other is assumed to be same as in 2011. *Ronald Johnson left Apple on Oct. 31, 2011. Jonathan Ive is now listed as a member of the leadership team on the Apple website. Absent more formal information, compensation for these individuals was not estimated. The data are for Apple’s 2011 and 2012 fiscal years, which do not correspond precisely to the calendar years. Apple’s fiscal year ends on the last Saturday of September. Compensation figures from a recent study by the AFL-CIO provide some context. The study examined 2011 compensation for CEOs of S&P 500 companies. Information was available for 313 such companies. The study found that Apple’s Cook had by far the highest compensation of any CEO; his pay was nearly five times that of the second-ranking CEO. The average pay among the CEOs was $13 million, a hefty amount to be sure. But this is less than one-quarter of the estimated $61 million in compensation to be received by six of Apple’s senior vice presidents in 2012. *The total compensation of the top nine Apple executives in 2011 is the same as the total compensation of 95,000 Chinese factory workers making Apple products. The figure for the number of Chinese workers is calculated by dividing $441 million (the total pay of the Apple executives) by $4,622 (the estimated average annual pay of the factory workers). *The total estimated compensation of Apple’s executive team in 2012 is the same as the total estimated compensation of 89,000 Chinese factory workers making Apple products. The vast majority of the compensation of Apple’s leadership team in 2011 and 2012 takes the form of restricted stock awards. These awards are intermittent in nature and somewhat difficult to value, features that merit discussion. The $376 million award given to Cook in 2011 when he succeeded the late Steve Jobs as CEO consists of one million restricted stock shares valued at the closing price of Apple stock on the date they were issued ($376.18 on Aug. 24, 2011). This valuation approach is dictated by SEC rules. The shares are “vested” over time; Cook does not actually receive the shares until they are vested. Contingent upon continued employment with Apple, half the shares vest in five years, the other half in 10 years. This award should not be considered a standard part of his annual salary, but it is unclear whether Cook will receive other stock awards before 2021. The $52 million in stock awards given to Cue in 2011 consists primarily of a $38 million award, vesting over four years, which he received when he was promoted to senior vice president. He also received a $14 million stock award earlier in the fiscal year when he was not a senior vice president, suggesting that generous stock awards may be extended to top Apple employees even when they are not part of the executive team. Altogether, the fiscal year 2012 stock awards already total one million shares (it is possible other awards will be granted). Following SEC practice, Apple will value these awards at $397 million in its 2012 proxy statement, as the closing price of Apple stock was $397.41 on Nov. 2. Apple’s traditional pattern of issuing stock awards indicates that the total compensation of its executive team may be significantly lower in 2013 than in 2012 (when its biannual regular stock awards for senior vice presidents were granted) or 2011 (when the large award was given to Cook when he became CEO). On the other hand, given the rise in the value of Apple stock, in one important respect the above figures may well understate the compensation of Apple’s executives. As noted, following SEC convention, the value of the stock awards is based on Apple’s share price on the date issued. But the prices have risen sharply since then. On April 27 Apple stock closed at $603; this represents a rise of three-fifths from its value when Cook received his one million restricted shares and of half since the senior vice presidents received their restricted shares. This means that Cook’s shares, valued at $376 million in this analysis, would be worth $603 million if they could be sold today. The actual value of these shares will not be determined until they vest, but as of now it appears that value will be far above the $376 million value used here. It also bears noting that while, on the one hand, the compensation figures here capture in part what is in effect future pay, on the other hand, the figures ignore current streams of income to Apple executives that reflect past pay. That is, the compensation figures ignore the large amounts of income these executives are receiving from cashing in on stock awards granted in previous years. In the first seven months of Apple’s fiscal year 2012, the executives examined here have already received roughly $400 million from selling stock they were awarded previously, but which became vested. The enormous pay levels of Apple’s executive team relative to the meager pay levels of the factory workers in China that produce its products has at least one significant implication. The FLA report, as well as numerous independent investigations that preceded it, make clear that these Foxconn workers not only receive extraordinarily low wages, but also endure extraordinarily difficult working conditions. The compensation Apple provides to its executives is one indication of the overwhelming resources Apple can draw on to improve the situation. Apple’s world class products and head of the class pay to its executives can and should be matched by ensuring reasonable working conditions and pay for the factory workers that make its products.